"Can you see the beauty in this picture? 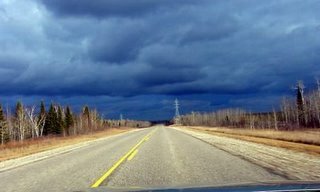 The trees are barren ... the sky is threatening ... the road is deserted ...I took this picture on my way home from the city today ... it looked so awesome, with the storm clouds hovering overhead ... yet the SON was still brightening the road I traveled on. I hope HE brightened your path today too!" Saija's post reminded me of my recent Attractive Drabness posts. Check them out here! And here!